The muzzle sweep on the initial presentation, and continuous poor muzzle discipline was a nice touch. Child soldier too! Trolls gonna troll. Interestingly enough the commercial was made many years ago by Amnesty International. Funny how it has the opposite effect they would have hoped for on gun owners, especially those with a sense of humor. $755 US for a full auto AKMS? Sign me up! Tells us more about these loop holes, I’m very interested. email me as soon as they tell you! Reminds me of the real HSN dude who accidentally stabbed himself with one of those junk Japanese swords (it broke) several years back. ahha I forgot about that. That was pretty awesome. Deminds me of Stern magazine’s cover of GWB as Rambo and his cabinet as action heroes. They thought it was insulting and sarcastic; President Bush thought it was funny, and the mazgazine sold out from Bush supporters wanting a copy as a souvinear. 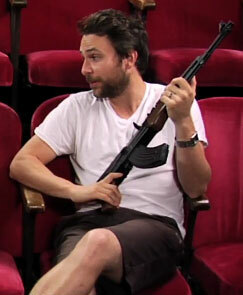 The Charlie Day image is perfect! Because most of these people come from gun hating Europe and are brainwashed into a guns = bad mentality. They don’t have a concept of civilian legal firearms so they don’t think to address it in their ads and slogans. I would call them in a heartbeat for an AK at that price. I really want to question some of these liberals on why the gun violence is so high in Chicago, NYC, and D.C. These are the same places that have tried to ban firearm ownership. And the worst is that for this price, in certain countries, you can get a crate of them, and the ammo and magazines for all of them. (although they may not technically be AK47 if I remember well, but you got the point). Pretty funny video, but once again Amnesty International uses the wrong means for their (obviously) good goal. this was put on the UK DVD edition of “Lords Of War”, the one about a Viktor Bout-type figure building his arms dealing empire.